George Strait is the King of Country Music, having sold more than 68.5 million records and counting. With 33 different platinum or multi-platinum albums, he's earned the second most certifications of any artist in any genre, following only Elvis Presley. 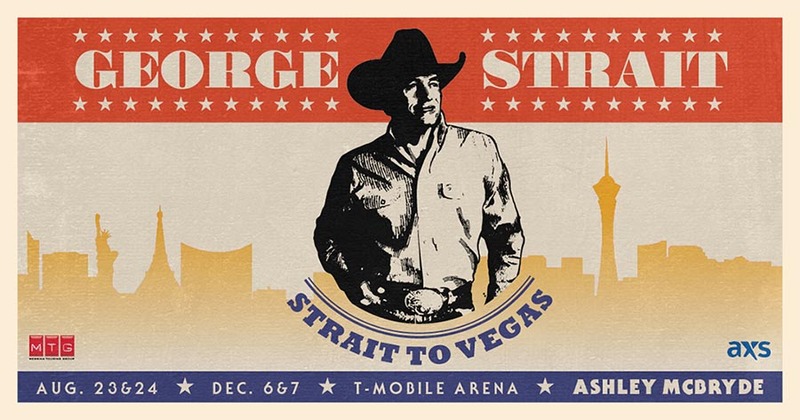 With a total of 60, George Strait has more #1 songs than any other artist in history (including Elvis). In Oct. 2011, Strait celebrated his first #1 as a songwriter with the debut single from his album of the same name "Here For A Good Time"– he wrote the song with his son Bubba (also his first #1 as a songwriter) and legendary songwriter Dean Dillon. With the songwriter spark ignited, Strait co-wrote three songs for his 40th studio album, Love Is Everything, which debuted at No. 1 on Billboard Country Albums Chart in May 2013 and features the Strait co-penned current single, "I Believe," and his 60th #1, "Give It All We've Got Tonight" on label home of more than 30 years, MCA Nashville. In July 2013, Strait was awarded Billboard's Legend of Live award. With a history holding the record for most number one albums, gold albums, and platinum albums, Strait is also the only artist in the history of music (all genres) to have a top ten hit every year for thirty years. He also is second all-time in top ten hits in the history of music currently ten away from breaking the all-time record held by Eddy Arnold who had 92 in his historic career. Strait was only the second artist at the time (after Eddy Arnold in 1966) to be inducted into the Country Music Hall of Fame (2006) while still actively recording and producing chart-topping hits and albums. And still five years later he is producing chart-topping hits and albums. Throughout his career, George Strait has received more than 60 major entertainment industry awards and countless nominations. He has been a nominee in the prestigious CMA Entertainer of the Year category 17 times, as well as a nominee for the CMA Male Vocalist of the Year 25 times. Strait currently holds the record for most CMA wins with 22. He is also the most nominated artist in CMA history with 81 Country Music Association nominations. He was the CMA Male Vocalist of the Year five times and the only artist in history to be so honored in two different decades. He has been nominated for the Male Vocalist honor an astonishing 25 times. He has won the prestigious CMA Album of the Year five times across three different decades proving he continues to make great music.